SEATTLE, Wash. — A viral video released this week by the Family Policy Institute of Washington shows students at the University of Washington outlining that they have no issue with a short white man identifying as a tall Chinese woman, and would not tell him that he is wrong. 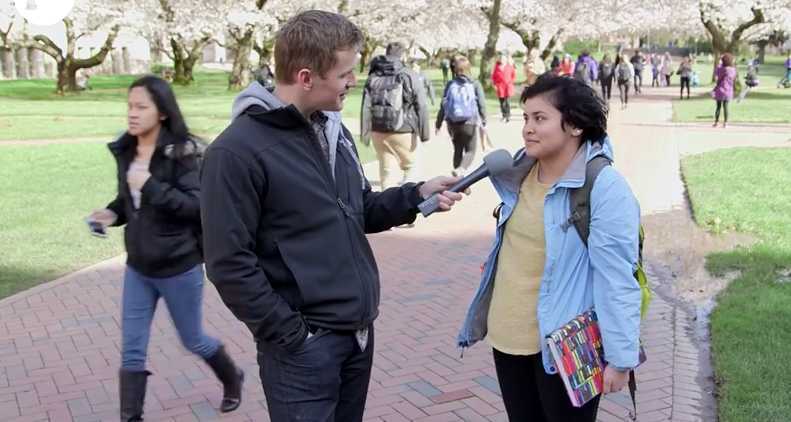 Joseph Backholm, the executive director of the Washington chapter of the Family Policy Institute, went to the campus of the University of Washington in Seattle to see if students believe that one can ever be wrong about their identity. “If I told you that I was a woman, what would your response be?” he asked. “Good for you,” one student replied. “I don’t have a problem with it,” another answered. Backholm then asked students what they would think if he told them that he identified as Chinese. “I would think that maybe you had some Chinese ancestor,” another said. Backholm also polled students about what they would think if he said he believed he was 6’5. “So you’d be willing to tell me I’m wrong?” Backholm asked. “I wouldn’t tell you you’re wrong,” the student replied. “I feel like that’s not my place to say as another human to say [that] someone is wrong, or to draw lines or boundaries,” another student said. “If you thoroughly debated me or explained why you felt you were 6’5, I feel like I would be very open to believing that you were 6’5 or Chinese or a woman,” a male student stated.